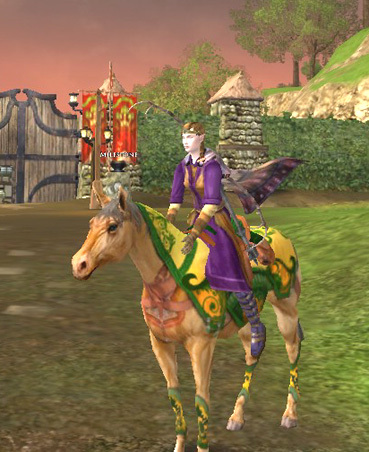 I play Lord of the Rings Online (LOTRO) and have since it betaed, many years ago. 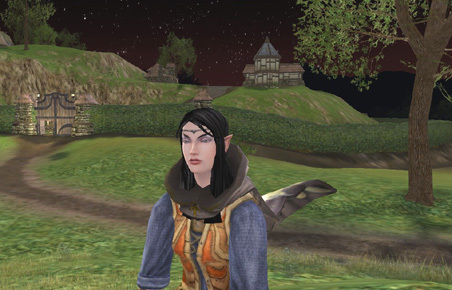 Before LOTRO, I played Dungeons & Dragons Online (DDO) which is why I was invited to participate in the beta. 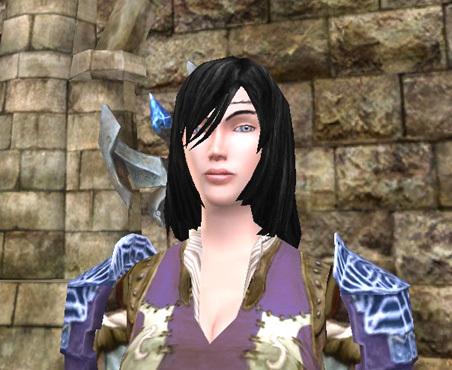 I joined DDO in 2006, so it's been quite a while. My DH plays much more frequently than I do - he's usually playing for an hour or two at least 4-5 days a week. I play in the late Fall through the Spring, but usually not during the Summer months at all. I have been owing pics to my friends, so here you go. Two pics from each of my characters on two different servers. Reahanel is on Firefoot. 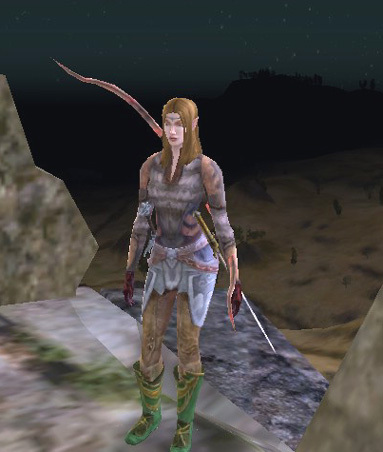 She's my level 65 Mirkwood elf hunter and she's vicious and great in a fight. I'll be working to get her up to the new 75 cap when Isenguard is released later this month. 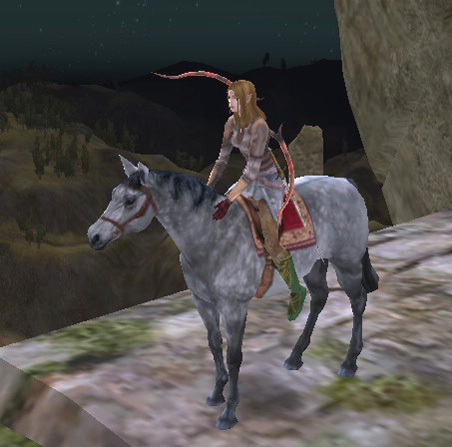 She rides a Prized Ashen Horse that she worked VERY hard for killing creatures in very dangerous places. It may not be the fastest horse, but it is my more cherished horse because I worked the hardest for it. She went to the top of Weathertop to give you the view from the heights. The East-West Road is the small brown line by her left foot in her standing pic. 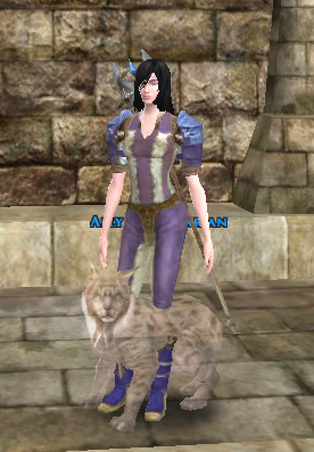 Engarian is my alter-ego, a Rivendell elven Lore-master, and also is on Firefoot. 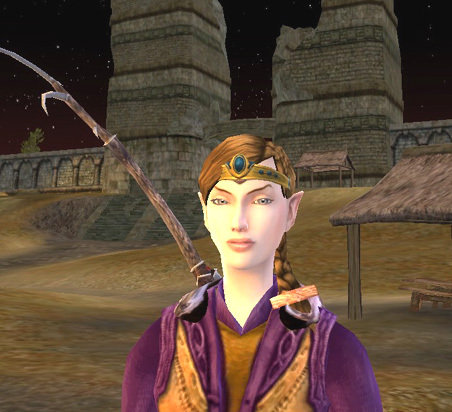 She is not nearly as advanced as Reahanel because it is harder for me to play a Lore-Master. Her "pet" is Igmu, a lovely bobcat. Gwilleth is my Lindon Elven hunter on Imladris server. I do a lot more with cosmetics on this server so she dresses pretty - LOL. I'm looking forward to getting her higher in levels and starting to kill some more deadly foes as she gets higher, but I know how easily she can die too :-( She is pictured outside Bree's southern gate. And finally, Callethwen is my Minstrel on Imladris. 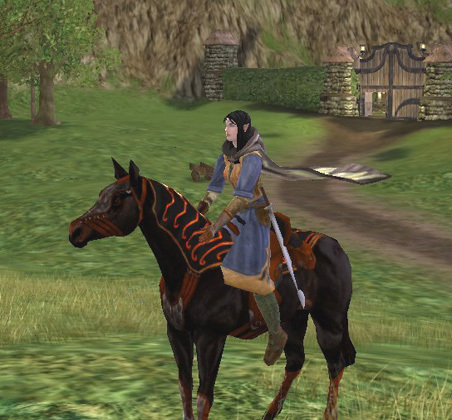 She is pictured outside the northern gate to Bree on her Steed of Night (she loves her horse). She can be quite powerful, but has a long way and many levels yet to go. For those of you who play on Imladris, you are always welcome to "tell" me. Thanks, Zhie! Hugs to you and your own DH.